In this article, I will share 5 most popular Pathfinder Ranger builds for Path of Exile 3.3 Incursion league, which is better than Bestiary league, in my opinion. You can find more PoE 3.3 builds on this page, by the way, if you want to buy PoE Currency in Incursion, just visit www.r4pg.com, where all PoE players can get what they want in the game. This build utilizes Pathfinder's Flask upkeep for Vinktar's Inpulsa's to spread electric blue explosions! The majority of the damage originates from scaling plenty of flat lightning harm to spells for Abberath's Hooves like a trigger for that "auto bombing." Now, this does not self-perpetuate in addition to letting us say a Cospri's Autobomber that scales crit. It will, however, have a similar feeling when it comes to shielding charging through maps and watching things explode. Abberath's will consistently pop packs in lower tier maps, that will trigger Inpulsa's explosions because of Vinktar's keeping the opponents shocked. Esh's Mirror, along with the keystone Elemental Overload, can help scale the harm of Impulse, Herald of Thunder, and Abbearth's. For single target, Vaal Breach makes stacking for Esh's Mirror easy. Honestly, an order of the is preference. Apply for Nature's Adrenaline for faster movement speed for levelling with Abberath's. You can check out Nature's Boon for flask upkeep, then hurry Master Alchemist so it's not necessary to be worried about your flasks. Honestly, just get whatever sounds good and roll by using it. You will have all of your ascendancy points eventually anyway. Lunaris: Reduced Physical Damage is nice, plus with improved with dodge more projectiles. Amazing for Incursions. Sharkari: Reduced Chaos Damage and immunity to poison; also amazing for Incursions. The build was initially supposed to have been combined with the abilities Barrage and Tornado Shot, but it may be utilized with virtually any bow skill. I've made some pretty substantial changes towards the build to help keep it functional, however it still remains an Elemental Conversion CI Pathfinder. Before I begin, please be aware that this form of the build is ideal in the standard league due to the accessibility to legacy ES gear, 2 barrage helmets, and % energy shield rings. Additionally, this isn't a financial budget build and can likely perform poorly if you don't invest a large amount of currency. 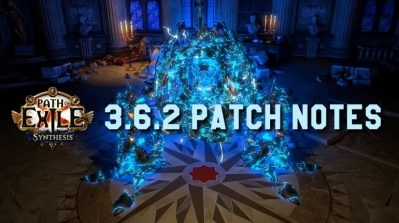 Initially, the build ended purely with Pathfinder, but due to the buffs to both Raider and Deadeye, additionally towards the nerf towards the Alchemist node around the tree, the 3 from the Ranger's ascendancy choices viable choices for the build. I prefer Pathfinder for the build, but I will still be including trees for all three Ascendancies if you decide otherwise. Due to the buff to the passive flask generation (from 1 charge every 3 sec to at least one per second), Pathfinder presently has near permanent uptime on its quicksilver flask, and consistency on the many other flasks since the build no more utilizes Vessel of Viktor. Additionally to getting the greatest movement speed from the three ascendancies, Pathfinder also elemental status effect immunity, a lot of free damage, much greater max elemental resistances, an, for me, the smoothest game play experience overall. 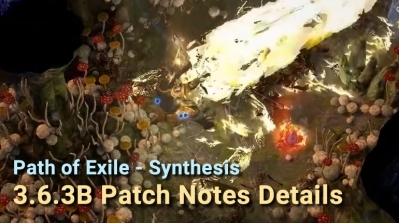 3.3 changes: The existing mechanics/items didn't change, works at least as good as before, can even be better with new incursion temple drops and new corruptions. Poet's Pen + Volatile Dead combo is among the most mainstream meta builds because it arrived on the scene, but my build's primary focus is defence. Two broad methods to bossing is damage hurry or steady tanking, using the first you concentrate on greatest DPS finishing the battle as quick as you possibly can, you need to dodge mostly all boss attacks and do mechanics to outlive, along with the second you try to tank the bosses, ignore most mechanics, perform some damage, perform the fight as lengthy because it takes steady but very slow. My build is incorporated in the second category, but Poet VD has excellent baseline damage, despite cheap gear, therefore the fights do not take too long. Probably the most costly needed gear may be the Zerphi flask, presently, around 17 exalts in Bestiary, other uniques are far cheaper, and you do not need costly rares so that you can allow it to be within 30-40 exalts total, also it does not scale much greater with increased. Watcher's eye is great to possess, although not strictly needed. For any build that you could easily farm Uber Elder and then any other boss hanging around with, it's a good investment. Bandit: I recommend 2 passives for boss killing if you need the damage/hp, but I personally chose Kraityn (6% attack/move speed, 3% attack dodge) for clear speed, which you don't really benefit from on bosses. Improvement options: Glove supports are only for highest mana cost, mine is only 110% * 110% * 120%, and you can get Poison support too with 135%, which is more ideal. I could get more resistances on helmet, to get more life and damage from rings. On belt recovery and one flask mod is the most important, after that highest life and possibly a second flask mod (duration). You should only use Vitality or Anger if you have a Watcher's eye jewel with the matching mod, otherwise, you can use Herald of Ash, Arctic Armour, or Purity. Do not use (50-70)% increased Life Recovery from Flasks while affected by Vitality, it doesn't work with Zerphi, I testd it myself. Yes, Pathfinder is not the most powerful ascendancy class in PoE 3.3, but it still a good Ranger class that worth to play, so these builds would be useful if you are a fan of Pathfinder. 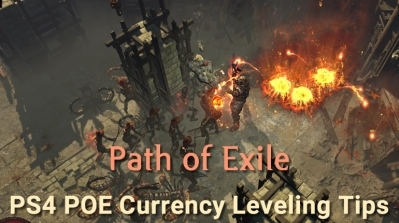 As for the Path of Exile Currency you need to finish your build, you can get them from our website, we can always help you, after all. 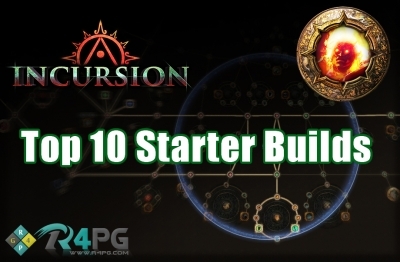 Welcome to join the revelry of Incursion league, and R4PG is going to share 10 POE 3.3 Starter Builds, which will bring more bring more advantages when you are getting in Incursion league, these builds could be perfectly used in new season.